Wenzel 11.5 x 10 Foot Shenanigan 5 Person Teepee Camping Tent is a summer camping lightweight single-pole structure with 3 windows, a fully sealed floor, and an incredible price. Wenzel 11.5 x 10 Foot Shenanigan 5 Person Teepee Camping Tent. 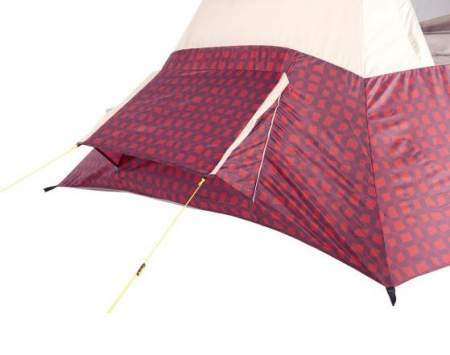 This tent is available on Amazon and I have seen it on several of their global stores, and I can tell you the price on Amazon-US is by a 1/3 lower than on the Wenzel’s site. 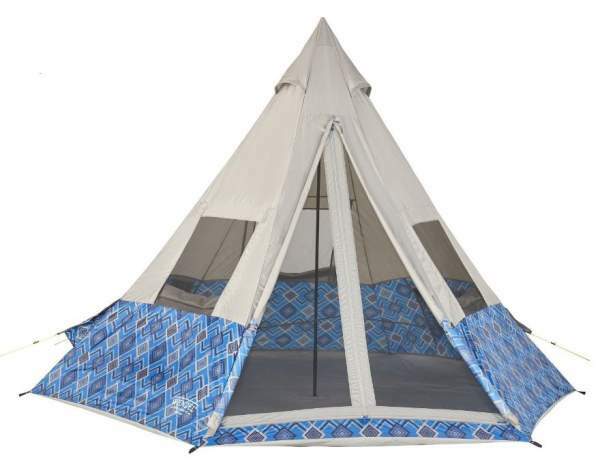 This Wenzel Shenanigan 5 Person Teepee is a part of a series which also includes an 8-version tent. As you realize from the name and from the pictures, this is a modern variant of a traditional tipi. You have one pole only and the tent is not freestanding, bear this in mind when you choose your camping spot. The structure is a single-room space and this is also a single-layer design with one entry point. It is very tall as you expect from such a design, the peak height is 90 inches (229 cm). I have included it in my list with very tall tents. The base is more or less a hexagon, so you start by spreading it and then staking all the corners. 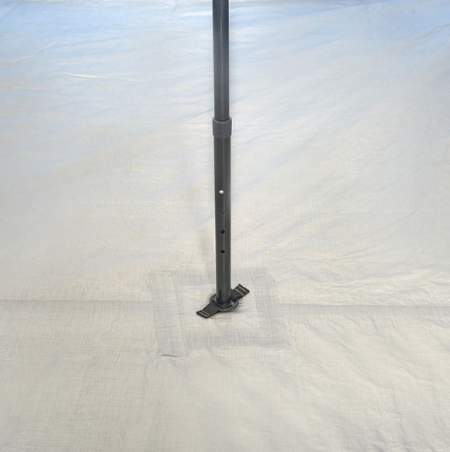 After that put the pole in the center, there is a plastic holder fixed to the floor (see the picture below), and put its top end to the top point of the tent. The pole is telescopic so pull it up as much as needed to get the roof expanded properly, there will be a spring button visible in the picture, that will pop up from inside the pole and it will lock the pole in the chosen length. With this the job is done, one person can easily do this in just a few minutes. The floor jack for the pole. There are 2 mesh pockets on the walls. The capacity: The declared capacity is 4 – 5 people. You have 86 ft² (8 m²) and in the case of 5 users this would give 17.2 ft² (1.6 m²) per person. This looks enough and it can work for a group of friends at some summer festival. For real camping, it is best to downgrade this to a maximum of 3 people, say parents with one small kid or just a couple. Seasons-wise & climate-wise: I have seen people asking if this is for real camping, so the answer is yes. But do not put it to harsh tests. The structure is very high, the fabric is thin, there are no many guylines, the waterproof rating is not given anywhere. So this is for quiet summer camping without much rain and without wind. There are plenty of options for venting and the tent’s floor is fully sealed, the mesh is on all the openings so you have protection from insects. 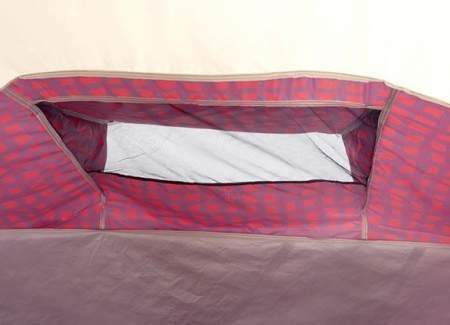 Weight-wise, the tent is great, it weighs only 10.75 lb (4.88 kg). Now, in view of its packed size which is 27.5 x 7.5 x 7.5 inches (70 x 19 x 19 cm), this is something you can indeed carry some shorter distances if the weight is shared among the users. But this is a camping item in general. The single layer canopy is polyester, there are no data given for its denier value and waterproof rating. The floor material is welded polyethylene so this kind of sealing is the most reliable for such materials and you can be sure that groundwater will not get in. There are three windows and all are with zippered panels and mesh, you would not expect this with such a budget-friendly tent, plus one door that is also with mesh and panel. There is nothing one could object to this design. You have all that is needed for optimal ventilation. There are two large low vents with guy out points, plus three vents on the top, and this alone will create lots of vertical air flow. But the windows and the door are also with mesh and you can keep them that way as long as the sky is clear. One of the two low vents. This is the view through the vent with mesh. There are three top vents. You have two mesh storage pockets on the walls. The single pole is steel. Inverted-T style zipper is on the door. 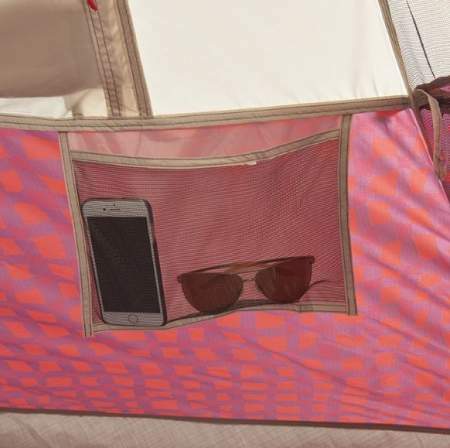 The tent is built in two different colors. The tent comes with a nicely designed carry bag. Declared capacity: 4 – 5 people. Weight: 10 lb 12 oz (10.75 lb; 4.88 kg). Floor dimensions: 138 x 120 in (350 x 305 cm). Floor area: 86 ft² (8 m²). Floor area per person: 17.2 ft² (1.6 m²). Peak height: 90 in (229 cm). Packed size: 27.5 x 7.5 x 7.5 in (70 x 19 x 19 cm). These two tents are different in size, but I thought you might want to see how they compare by some parameters and prices. So please check the table below. As you realize the area/weight ratio is almost the same. Both are exceptionally affordable tents. Please read more here about the Winterial Teepee. So this Wenzel Shenanigan 5 Person Teepee Camping Tent is based on a classic design but with modern elements and functionality. This includes the single pole setup which is really fast and easy, and the fully sealed floor. The three windows are also a nice feature, and when combined with all 5 vents you will have an excellent hi-low ventilation system to fight condensation in such a single-layer design. This is a great tent for summer fun. I have added this tent to my list with best teepee tents for camping. If you need something different, just look around, this site is all about family camping tents and you have them here in hundreds. Note that this is not a sponsored text and I have no relation with the brand. 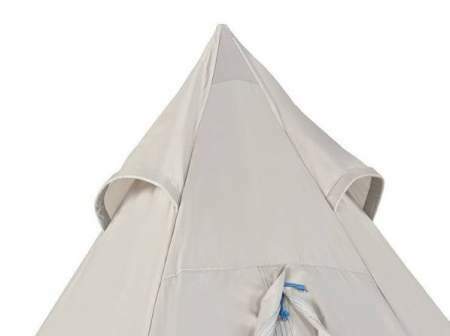 Do you have any experience with this teepee? If so please share your thoughts, there is a comment box below.